Sainsbury's wanted simple, solid colour products that they could display in blocks of colour in store for maximum impact. Whilst much of the range was sourced from existing product, Sainsbury's wanted a few original key items in the range to differentiate themselves from bland, much-the-same kitchen offerings from their rivals in the incredibly competitive supermarket industry. The client quickly jumped on two designs I presented early on in the project; a mixing bowl and colander combination, and a two-sided grater. Mixing bowls and colanders are two notoriously bulky items that are awkward and unwieldy to store at home thanks to their shape and size. Most people will try to stack them inside each other, but buying them separately means they won't fit or won't sit upright. Why not have them nest inside each other neatly to save space and shipping costs that might inflate the final retail price of the product? The pair sit inside each other and locate neatly for a flush finish, owing to a grooved top lip on the colander, which also offers somewhere handy to hold while in use. The colander also has a flat bottom so you can store other things upright inside it in limited kitchen cupboard space. Finally, the mixing bowl has a subtle lip that blends into the rounded body as not to distract from the otherwise seamless interaction between the two, and a silicone foot on the bottom to grip the work top in use. 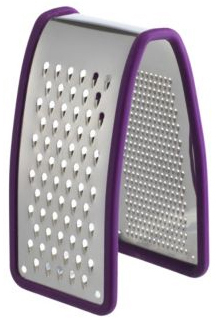 From personal experience, inexpensive, mass-manufactured cheese graters are flimsy and tend to break easily. They have a poor fit and finish where separate parts meet, which not only is unsightly, but creates a food trap which is unpleasant and difficult to clean. The idea behind the grater for Sainsbury's was to pare the product back to as few simple parts as possible, to prevent these issues, present a unique aesthetic and still make sure they're stackable for the supermarket shelf. 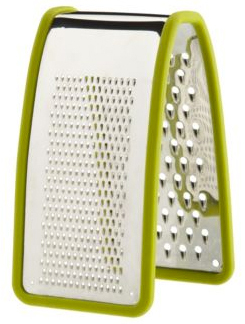 The grater has two different grating surfaces and features a silicone band that flows around every outer edge to ensure it stays still in use and to provide the flash of colour that the Sainsbury's range was based on.